I kinda agree with this one...mainly 'cause you remembered that he's supposed to have two heads. Hey, mine also has two heads. They just are not next to each other because it was never said that the two heads have to be both on his shoulders. But this is a killer design. But you´re right, that is a uber awesome Horde Prime redesign. Respect Skelepimp. Maybe it's not two heads at the same time, but interchangeable ones? One sad, one happy! But seriously tho, maybe he's got a bigger exo-body that he's hooked up too ussually, thereby the immense Filmation-size, but a smaller cyborg-form inside of it, hence fathering a son. Wow, I just got finished saying I think Horde Prime shouldn't be seen, but here's a whole ton of ideas for him! I love Skelepimp's design, that's a really neat looking sketch even without being Horde Prime. I'm a big fan also of Battle Brak's design, though I'm content to call him Tyrannak since that became his name for the fan bust challenge last year. The one time I drew Horde Prime was almost a year ago purely as an exercise and not a real effort to visualize my ideal for him. At the time I totally forgot about the two heads and was thinking there'd be a second face one the other side of his helmet (like the Quintisons or whatever from the post-movie Transformers). 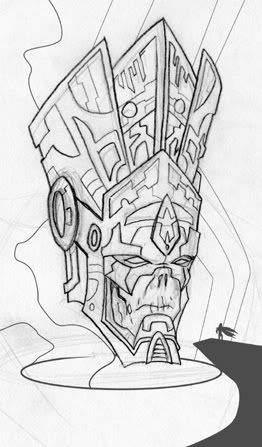 He ended up looking like Galactus anyway, but that was the kind of scale I think Horde Prime needs to be at. JITSU!!!! Thank the Elder Gods!!!! Very cool design, Gbabok! I love the scale and it's a cool interpretation...Great work! Last edited by SKELEPIMP; December 17, 2006 at 01:02am. I've always seen Horde Prime as a sort of Wizard of Oz type character. The filmation Horde Prime was just so huge, and Mysterious that I could imagine there was a much weaker little being behind it. Old dieing Villain in a Massive protective shell that keeps him alive. (Basically its the old comic version aged and dieing in a filmation giant robot suit, with vapor) His true power comes from his many empires throughout the gallaxy. He encases himself in the suit as protection, to keep up the scary apperances, It also keeps him alive as it feeds him the power collected by the many arms of the Horde. I like this Horde-Prime because then all the versions we've seen are all rolled into one concept. This would also mean that he could take many giant mechanical forms as well. Also the Giant Horde Prime could have never fit on that ship of his. I see the ship as another one of his Vessels, only "the Velvet Glove" was mobile. BTW, these all turned out really nice. Didn't 2-bad have a Horde-Prime too? Last edited by Buffalo-Bill-Man; December 23, 2006 at 09:27am. That's a really nice take on the Horde Prime myth, BBM. I think I will understand it better with some accompanied art of yours. ANother concept I suppose with Horde Prime could be to portray him like something like Unicron? Yes, like the Master Control from Tron, or even Sortech from the MYP series episode "Of Machines and Men." I agree that is an ideal truth behind HP, but then it seems like the kind of secret that shouldn't be revealed until the very end of the character's battle with He-Man and She-Ra. thor, I think sans the psychic headaches, the Filmation version was pretty much just like Unicron but without the feature-quality animation and big name voice actor. And Unicron was basically Galactus as a Transformer...it always comes back to Jack Kirby somehow. Out of curiosity, would your version of Horde Prime be with the Horde Council you've been cooking up recently...almost worshipped as a god, or would you abolish the idea altogether? I agree with the idea that the Horde Prime should be this Wizard of Oz type figure. Let's our imaginations run... which is sometimes better than actually knowing what way things really are. I've never taken a shot at Horde Prime. But I'll sure try to come up with something. All these are just Amazing. Gbagok, PLEASE color that pic. He looks so Awesome!! www.TheBeastLegion.com is officially online. You can read the Manga in it's entirity there! Hope you give it a try enjoy it. Beast Legion FaceBook Page ...Join me & help spread the word!! gbagok your horde prime is looking outstanding. i got an idea how i could build him as custom. if you want to know more i will mail you. I'll have to color mine sometime next week as this week I'm going to be away. Hordak's Henchman, I'll send you a PM. In my own mind, they would act together, the Horde Overlords are Horde Prime's main enforcers and only they get to have an audience with him (and then it's only the Oz-head kind of deal). Mostly however, they are to act at their own discretion, holding council and serving to plunder the universe to feed Horde Prime's insatiable appetite for raw materials. They'd only have to communicate with him when he demands it, and that would happen more regularly as He-Man and She-Ra disrupt the Horde agenda. I kind of see Hordak as Horde Prime's main hand, and they maybe have a kind of psychic link that's unique from the other overlords, not unlike Lord Dread and Overmind in Captain Power-- which was a little more codependent than the relationship of Unicron and Galvatron in Transformers the Movie. I make that distinction because I think Skeletor was Galvatron to Hordak's Unicron in the new show, complete with psychic headaches. It also elevates Hordak more, which I think most Hordak fans prefer and maybe makes it a little easier for them to accept a Horde Prime character than the "Hordak has a boss like everybody else" feel that the Filmation version had. At any rate I thought this was a cool take on the idea even if it's not a Prime. I like this design. Makes me think of Galactus from Marvel Comics. Hmm, I actually like that Wizard of Oz idea! I've always been against Horde Prime personally, but maybe there is some possibility with that and Gbagok's idea. Anyhoo, I say Hordak eventually gets fed up with being subservient to Prime and challenges him only to discover the weak being within, whom he abruptly destroys and then proceeds to rule the Horde on his own terms. Also, weren't Prime and Hordak supposed to be brothers? Evil Simian Mechanic of the Horde! if Horde Prime was the leader of the Horde, then why was Hordak's face on the emblem of the Horde? For my version, the armor was based on the UK comic book version, while the hand was based on the cartoon depiction. His head and face are, of course, based on the Horde symbol (or by retro-continuity, the basis for the Horde Symbol). As for the extra head, I just wanted to give him his extra head in an unexpected way. Oh, and I assume that Horde Prime is, like Hordak, a shapeshifter, so the secondary head can retract and morph back into an eyeball. Character-wise, I view Horde Prime as Hordak's brother, who started out roughly-human sized like Hordak. Over time, his shapeshifting abilities developed further, and eventually he was able to use his powers to increase his size. Visit my sketchblog at its new URL: JASONBOT.com! I love how you've handled the two heads thing! I'm not sure it would hurt if the eye stayed looking like another face in the eye socket though. The main head might be a little too much like Skeletor, but it's still a terrifically horrifying visage. Really great work! yeah--like you said, i was thinking that the secondary head could just kind of embed itself in the eye socket, but i was also thinking that when it sits in the socket, maybe it closes its eyes and a big yellow eyeball sprouts in its mouth. and i agree with you about the skeletor resemblance, though that was semi-intentional. you know how hordak has cheeks and sort of has lips? i was trying to show that while hordak comes from a race with skull-like faces, horde prime (from the same race of course) was actually decaying, so he was becoming more skull like--possibly as the result of his abuse of dark sorcery etcetera. hopefully the resulting skeletor resemblance isn't too distracting! My take on Zed would be that he's just like Adora, an enemy's child who was kidnapped as an infant and raised by the Horde. Presumably Zed would be to Horde Prime what Adora is to Hordak (although I think it works better if Zed is subordinate to Hordak, but that's me). thanks skeletoncrew! i try to incorporate as much stuff as i can, though admittedly i am not too familiar with the 200x stuff (missed out on the cartoon because i don't have cable, though i did read most of the comics), and i probably lean heavily towards the filmation/classic toy side of things. as for prince zed, gbagok took the words right outta my mouth! when zed discovers the truth, maybe he becomes a part of the rebellion? that could have some good story possibilities... someone who's not as lazy as me should make a fan comic! hmmm... i think i see what you mean, especially about the chin... i had a vague idea to draw a static full-body shot of horde prime. i'll try some head variations when i do that. All times are GMT -4. The time now is 01:11am.